Male Southern Blue Devil guarding nest of eggs, above and behind on wall of a rocky cave. Image: Larry P. Tackett. Foods & Feeding: Meaty foods such as Mysis Shrimp, adult Artemia, krill. A new specimen may need live grass shrimp to elicit a feeding response. Reef Safe? A threat to small fishes and ornamental crustaceans; harmless with corals and Tridacna clams. 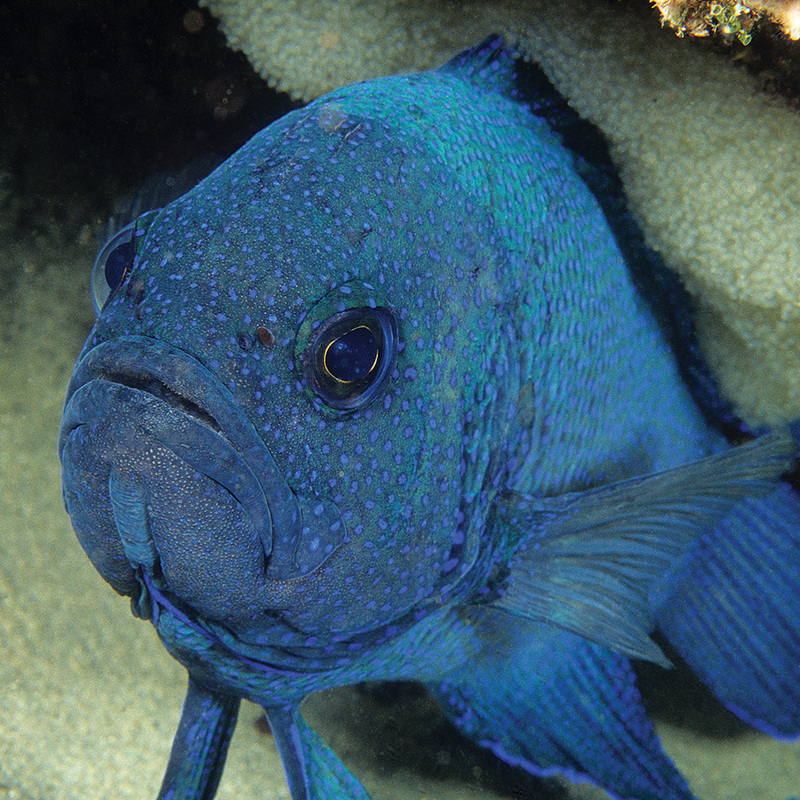 The Southern Blue Devil, Paraplesiops meleagris, is known to marine aquarists Down Under as a cave-dwelling, cryptic species in the longfin family, Plesiopidae (roundheads and assessors), endemic to southern Australia. Aquarists in North America and Europe are familiar with a close relative that is relatively common in the aquarium trade: the Comet or Marine Betta, Calloplesiops altivelis (Steindachner, 1903). In its reproductive coloration, it can be startlingly beautiful and some enthusiasts believe it warrants its own species tank, where it may prefer cooler water. Care requirements should be similar to those of the Comet (see Michael, 2001). Note its full size; it gets big enough in the wild to be considered very good eating. This species is sometimes confusingly sold as the Western Blue Devil. (It is not from Western Australia.) Wikipedia cites three different species of Blue Devils from Australia: The southern blue devil, Paraplesiops meleagris, is a species of fish in the longfin family Plesiopidae, which is endemic to southern Australia. It is a close relative of the eastern blue devil (Paraplesiops bleekeri), which lives in the coastal waters of eastern Australia, and of the western blue devil (P. sinclairi), of southwestern Western Australia with which it is sometimes considered conspecific. The Australian Museum also lists a similar species from southeastern Australia, Alison’s Blue Devil, Paraplesiops alisonae, that is reportedly smaller, growing to 15 cm (6 in). Photograph by Larry P. Tackett, taken off Kangaroo Island, Southern Australia. Michael, Scott. W. 2001. A PocketExpert Guide: Marine Fishes, p 130. Microcosm/TFH. CORAL's Reef Life 2017 Calendar Now Shipping!